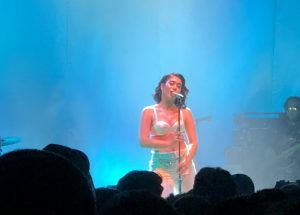 On October 9 and October 10, Columbian-American artist Kali Uchis took the 9:30 Club stage. Originally from Alexandria, VA., Kali had a performance which felt close to home. Her stage presence shined beyond a revolving disco and accompanying live musicians. After an upbeat set from Gabriel Garzón-Montano, Kali opened the show with “Dead to Me”, one of her many unapologetic tracks off of her debut album Isolation (2018). Her stage presence and her confidence truly took form on stage. Take her slower songs, like “Loner” – though the song off Por Vida – EP (2015) is regimented in anxious narrative, no one ever went rogue and stopped feeling what Kali felt. Everyone was there with her, singing in unison, swaying in the moment and taking a glimpse into her world. Shortened, stripped down versions of “In My Dreams” and “Miami” followed, and a pure, genuine energy reigned in the crowd. But it couldn’t have been done without the talented musicians to back her up. The live instrumentals are what set apart Kali’s distinct vocals. Overall, the performance was inviting, complex and was elevated by immersive jazz. Kali curated a bittersweet tango that danced around her most intimate thoughts.